This graphic was originally published by the Africa Center for Strategic Studies (ACSS) on 20 March 2017. After losing territory in Iraq and Syria, ISIS has affirmed its intention to expand its operations into Africa. A review of militant group activity on the continent, however, suggests that ISIS will be challenged to do so. Updated: November 2016. Note: Compiled by the Africa Center, this graphic shows violent events involving the listed groups over the 12-month period ending October 31, 2016. Group listings are intended for informational purposes only and should not be considered official designations. Due to the Fluid nature of many groups, the listed affiliations may change. 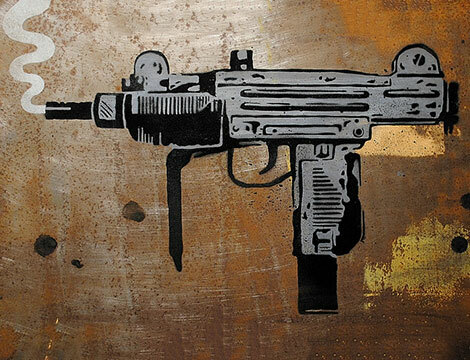 Sources: Armed Conflict Location & Event Data Project (ACLED); Daniel Byman; Jane’s Terrorism and Insurgency Centre; Thomas Joscelyn; SITE Intelligence Group; The Soufan Group; Stanford University’s Mapping Militants Project; Stratfor; Terrorism Research & Analysis Consortium (TRAC); and Aaron Y. Zelin. 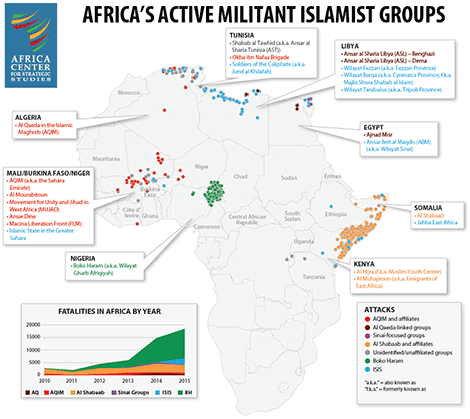 The threat from militant Islamist groups in Africa is not monolithic but comprised of a variety of distinct entities. The local territorial or political objectives of these groups make it unlikely that ISIS will be able to substantially extend its influence in Africa. ISIS is not well-rooted in the communities where Africa’s most active violent Islamist groups operate. Its closest ties are in Tunisia (the largest source of foreign fighters in Iraq and Syria) and Egypt (via Ansar Beit al Maqdis), plus a cadre of fighters displaced from Sirte and the Sahel. ISIS’s continued loss of territory and operational capacity in Iraq and Syria may lead to an increase in jihadis returning to regions in Africa already facing a threat from violent Islamists. But without funding and technical support, these militants are more likely to simply melt into the complex matrix of violent Islamist groups already active in these regions rather than create an expanded ISIS presence. Boko Haram and Al Shaabab—the most lethal violent Islamist groups in Africa—predate ISIS, are well-integrated in their communities, and do not need ISIS for resources or operational support. The threats these groups pose, therefore, is likely to be unaffected by what happens to ISIS in Syria and Iraq. Dr Joseph Siegle is the Director of Research at the Africa Center for Strategic Studies (ACSS).